To lead our Morning Service, we welcomed our Worship Leaders. Through various readings and meditations, they drew our thoughts to look at the choices we make. Worship Leaders are not recognised Preachers in the Methodist Church, so cannot provide a sermon. They do, however, make use of other published material to very effectively support our worship. Order of Service for 17th March 2019. Lent Liturgy : Towel and Basin. Singing The Faith No. 255 “The Kingdom of God”. Prayers of Confession, Praise and Thanksgiving. 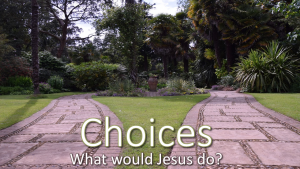 Children’s Talk : Choices – What would Jesus do ? Singing The Faith No. 531 “What a friend we have in Jesus”. Reading: Genesis chapter 13 verses 1 to 18. Singing The Faith No. 677 “Christ is made the sure foundation”. Reading: Luke chapter 13 verses 31 to 35. Singing The Faith No. 477 “Jesus be the centre”. Singing The Faith No. 682 “God of grace and God of glory”. Postlude: Voluntary Opus 5 No 1 Andante by John Stanley.